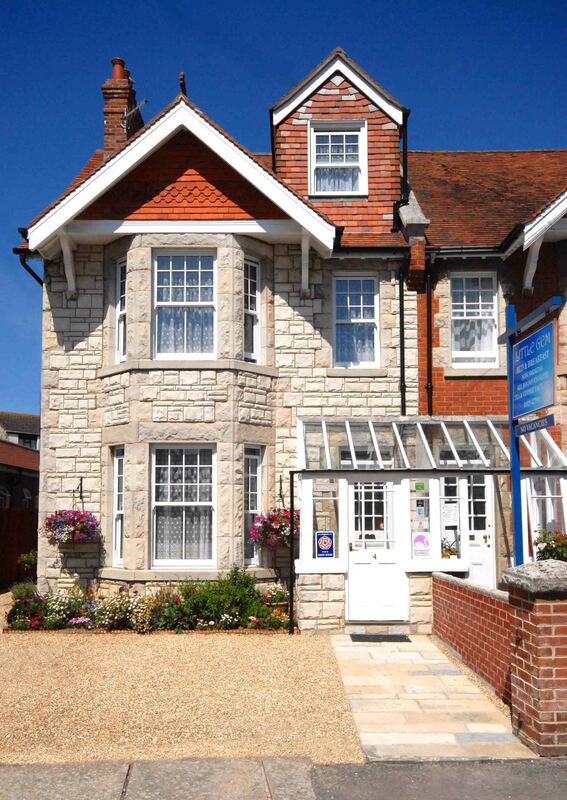 Little Gem is an Edwardian house built in 1902 situated in the Victorian Seaside town of Swanage, gateway to the beautiful Jurassic coastline, stretching from Old Harry Studland, to Orcombe Point East Devon 95 miles east. We aim to meet the needs of all our guests, however, there may be some period features that may make access difficult for people with limited mobility. If you have any specific questions you would like to discuss please contact us. We offer 4 bedrooms with en-suite facilities, one of which is on the ground floor close to the front door, with a short level walk to the Breakfast Room. We have a no smoking policy within the building. Smokers are welcome to use the garden area on request. Children aged 10 to 16 are welcome, but must share a room with an adult. Bookings and enquiries can be made by telephone or e-mail. Please see the contact page on our website or the closing paragraph of this document for details. Normal check in is 4pm, but earlier or later check-in times are possible by arrangement, or optionally you may wish to just drop off luggage on the day of arrival, and return as soon as your room is prepared. The following information is provided to help you plan your journey to ‘Little Gem, Swanage’. For full details of how to reach us by car please see the ‘Location’ section on our website. The nearest bus stop is 3 minutes walk at the end of Cecil Road on the ‘High Street’ with services 7 days a week where a No. 40 Wilts & Dorset bus service operates approximately every hour between Poole – Wareham Station – Corfe – Swanage. Service is less frequent after 7 pm. You can check updated bus times on your mobile using www.nextbuses.mobi. Taxis are readily available. See our website page ‘Activities & Events’ for local taxi numbers. The nearest mainline train station is Wareham. Taxis and Buses operate between Wareham Station and Swanage. Swanage Railway currently only runs as far as Corfe Castle & Norden. See www.swanagerailway.co.uk for current schedules. By Spring 2017 there will be a scheduled rail link operating between Wareham and Swanage. ‘Little Gem’ is situated in Cecil Road, a quiet, residential area between ‘Kings Road West’ (20 yards) and the ‘High Street’ (75 yards), and is easily accessible by road. There is free parking for two cars on the front driveway, on a first come first served basis. There is also free unrestricted parking on Cecil Road and the adjacent residential Kings Road West. We are able to assist guests with their luggage on arrival and departure, if required. A paved footpath leading to a 8 inch step up to the 28 inch wide porch doorway opening to a small porch area with a porch light for your safety and convenience. In the porch area there is a boot tray for sandy & muddy boots and a small seat. On your arrival please ring the doorbell to the left of the front door. The 30 inch wide front door has a 5 inch step up to the main entrance hallway and reception area. On entry to the right, there is a fire extinguisher, which can be used on any type of fire in the event of an emergency. On arrival guests are asked to complete a registration form and are then shown their room where all the facilities are explained. A Room Key and Front Door Key are provided, for guests to use at their leisure and a suitable breakfast time is arranged. Guests are asked to settle accounts on arrival. There are hard-wired emergency fire safety lights on the upper landing and the downstairs hallway, should the power fail. There are radio-linked smoke alarms in the hallway and dining room and battery smoke alarms in all the bedrooms. The reception, hall, stairs, landing and corridors are all carpeted. There are 16 stairs (W 76cm D 25cm H 17cm) with a single handrail to the first floor bedrooms. At the top of the stairs there is a fire extinguisher, which can be used on any type of fire in the event of an emergency. There is a small private W.C. on the ground floor that is available to guests with walking difficulties, who are staying on the first floor but may wish to use the convenience during the day without having to return to their room. This facility has a toilet, washbasin, mirror, hand soap, towel, disposal bin and vinyl flooring and is serviced regularly. There is level entry from the ground floor carpeted reception area to the vinyl floored Breakfast / Dining Room through a doorway which is 27 inches wide. This is where breakfast is served. All hot food is cooked to order. Breakfast is served, but you are able to freely help yourself to fruit juice, cereal, yoghurt, fruit and coffee. Special breakfast dietary requirements can be catered for on request. Guests are welcome to use the Breakfast / Dining Room and the crockery, glassware and cutlery provided on request if they wish to bring back take-away food to the Guest House. We will clear up for you. The dining room is also available for the use of board games, playing cards or as a social area. Please ask if you wish to use this facility. The dining room and kitchen have fire doors. There are no laundry facilities on the premises but a laundrette is available at 59 Kings Road West, Swanage, about 5 minutes walk away. If you have wet beachwear and towels we are happy to rinse and dry these items, please ask for further details. All the bedrooms have fire doors and smoke alarms. Emergency instructions in the event of fire are displayed in bedrooms, on the back of the door. For your own safety and that of other guests please read these. We offer 4 guest rooms all of which are en-suite, with double glazed windows, and thermostatic radiator valves for temperature control and blackout curtains. All bedrooms are carpeted, with a central main light and touch sensitive bedside light. Furniture comprises a wardrobe, chest of drawers, bedside cabinet/s and a minimum of one chair. Some furniture can be moved on request. West facing window, at the front of the house. Doorway width: Bedroom 27’’, En-suite 29’‘ Shower step up 5’’. King Size Double Bed 5’ wide. East facing window, at the side of the house. Two single beds each 3’ wide. East facing window, at the back of the house overlooking the garden. Doorway width: Bedroom 26’’, En-suite 26’’, Shower step up 5’’. Double-glazed lockable casement windows. Full-length mirror. A larger than average sized shower enclosure (see website photo). Room 4 is our most easily accessible room and is located just inside the front doorway entrance and on a level walk to the Breakfast Room. West facing window, at the front of the house immediately to the left inside the main entrance and is suitable for less mobile guests. Doorway width: Bedroom 30’’, En-suite 29.5’’, Shower step up 5.5’’. Double-glazed sash windows with child locks. Full-length mirror. En-suite Shower Rooms & WCs. All en-suite rooms have a low flush toilet, washbasin, mirror, shaver point, toiletry shelf, shower enclosure with pressurised water flow & thermostatic mixer taps, shower caddy, non-slip shower mat, floor mat, disposal bin, disposal bags, bathroom tumbler, robe hooks and towel rail. Every guest is provided with a hand towel & bath towel. Toilet rolls, shower cap and liquid on-site toiletries are also provided. The en-suite rooms have vinyl flooring and are semi tiled. Room 2 & 3 have thermostatically controlled radiators in the en-suite rooms in addition to the bedroom radiators. Guests are welcome to use the grounds and garden at the rear of the house on request. It is accessible from the front of the house via an un-even gravel and paved sloping side passageway and one 7 inch step. The garden gate will take you through to a ‘charming’ mature garden with sloping lawn and borders, vegetable patch and magnolia and fruit trees. ’The Summerhouse’ with seating and table, with a pleasant view of the garden is available for use on request. Due to the sloping nature of the garden, access requires a high step up. There is also a level patio, garden table, garden chairs and garden benches. Cyclists are welcome to padlock and keep their bikes in our gated garden overnight. When booking we accept payment by Cheque, Bank Transfer and PayPal. Final payments should be made by Cash or Cheque. We do not have a credit / debit card facility. An ironing board and iron is available on request. *See our Activities & Events website page for further details of local facilities. 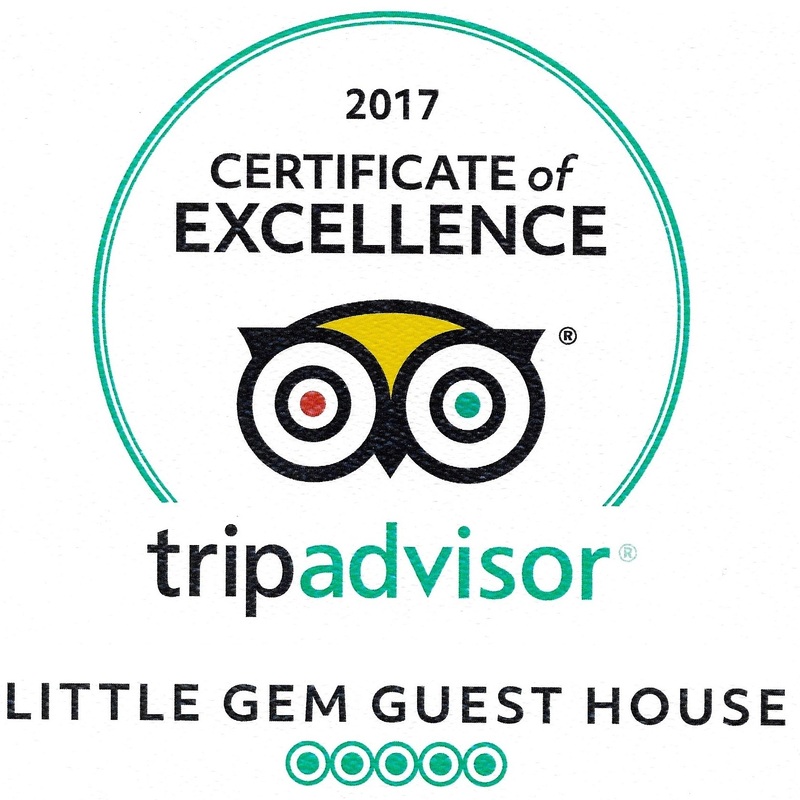 ‘Little Gem Guest House’ is committed to ensuring that your privacy is protected. Should we ask you to provide certain information by which you can be identified, then you can rest assured it will only be used in accordance with this privacy statement. What we collect: Name and contact information including email address. Registration cards are completed on arrival and are kept for a period of seven years for legal and Inland Revenue purposes. What we do with this information: We receive this information to understand your needs and provide you with a better service, and in particular for the following reasons: Responding to your questions and comments; to improve our products and services; to contact you regarding any property which you may have inadvertently left behind. Our website contains links to other websites of interest. However, once you have used these links to leave our site, you should note that we do not have any control over that other website. Therefore we cannot be responsible for the protection and privacy of any information which you provide whilst visiting such sites and such sites are not governed by this privacy statement. You should exercise caution and look at the privacy statement applicable to the website in question. Any changes to this privacy statement will be posted on this website so users are always aware of the information collected, the reasons for such collection and the purposes, if any, to which ‘Little Gem Guest House’ may put this information. We welcome your feedback and if you have any ideas or comments that would make your stay more comfortable we would be happy to hear from you.